Our farm market is open Monday-Friday 9am-6pm and Saturdays 9am-5pm from May-October. The rest of the year, you are welcome to stop in or call ahead Monday to Saturday. We have pure maple syrup, honey, baking, freezer beef, preserves, jams and jellies. All of our baking, preserves, jams, jellies are made from scratch, in our farm in our own health inspected kitchen. We also carry other local produce including eggs, greenhouse tomatoes, and locally made cheese. Gift baskets in a variety of sizes are also available. Clean washrooms with flush toilets are available in our market. Like us on Facebook or follow us on Twitter to get regular updates. Please call ahead at other times of year to ensure that someone will be available to serve you. Available fresh in May and early June, and available frozen the rest of the year. Strawberries will be ready early in June. Our Day Neutrals or Ever-bearing strawberries are available from Mid May to October. Want to know the day they are ready to pick? Call or email us and we will add you to our email list. Try some of our fresh made strawberry jam. We grow 7 varieties of both yellow and bi-colour sweet corn from mid July until October. Mmmm! Shell peas (you just eat the pea) and Sugar Snaps (you can shell them or eat the pod and all- very sweet) will be ready sometime in June. We have all sizes and shapes. 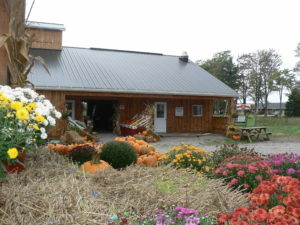 Come to the farm and pick your pumpkin and enjoy some hot cider and other fresh vegetables and the corn maze in October. We grow a wide variety of squash for decorating and for eating. Mmmm! and good for you too. We will have lots of sweet potatoes starting mid Aug. Plump juicy tomatoes are available Late July to October. By the quart, 6qt, or bushel. Call or email for information or to order yours today. Maple Syrup A variety of sizes available from 40ml flavours to 4 Litre jugs. Contact us for pricing. Comes in many seasonal fruit varieties.